Corsica in spring, sunny days, great food & fine rivers. Early season paddling at it’s best, a range of pool drop & boulder garden runs, with warm days, wonderful local food and fine wine to sip in the evenings. A great adventure under our guiding hand, targeted coaching to make your lines great. A springtime paddling paradise basking in the blue of the mediterranean, Corsica is home to some of the finest rivers, food, and wine in Europe. Join renowned Gene17 Guide Jakub Sedivy to sample pool drop and boulder garden rivers complemented by excellent local cuisine. Each spring, before the melt starts in the Alps, the sun is already warming the rocks of Corsica, and there’s no better place for an early spring adventure. Corsica’s rivers run over smooth granite boulders and bedrock, creating clean lines, perfect moves, and deep, clear pools. This authentic Corsican experience features fine food, fine wine and perfect paddling, along with world class river guides and Corsican hosts. The trip will be led by an experienced Gene17kayaking appointed trip leader. 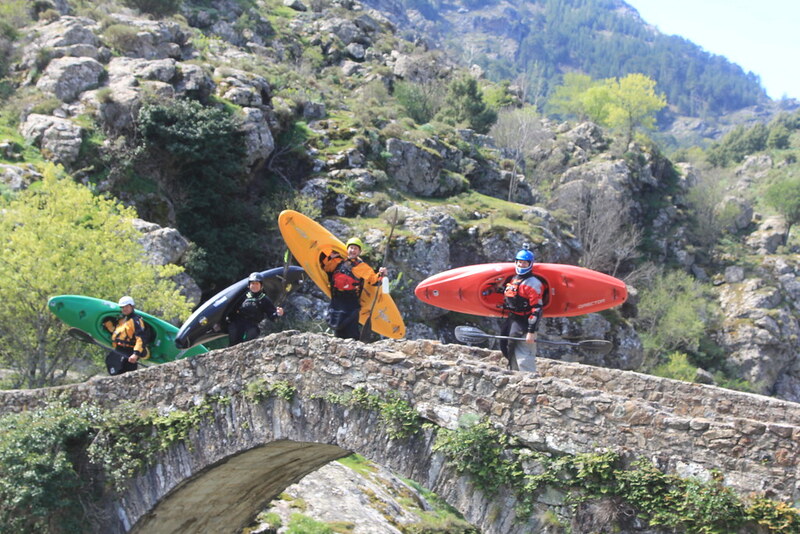 In selecting suitable leaders, we not only look to ensure that they have the relevant qualifications but we also ensure that they have an excellent track record of white water paddling from around the world. Whilst qualifications and experience are essential requirements, we also make sure that our leaders have the right temperament to lead a trip group comprised of individuals who have a range of previous experience and expectations. The leader is a vital contributor to the enjoyment and well-being of the trip members and he or she will be there to deal with any unexpected problems. To that end, we aim to provide a leader who will make the trip both successful and enjoyable throughout. Our leaders hold current wilderness first aid certificates and have experience of dealing with remote river related medical conditions. We will take a maximum of 6 paddlers on each trip, although the number may well be less than this. With every 3 paddlers we have on the trip, we’ll have a highly experienced Gene17kayaking Teacher/Guide. Corsica Road Trip takes place on Class III/IV whitewater. Generally the rivers are accessible with far road access, but occasionally there may be some exposed terrain. This trip begins on an easier section of whitewater, but will soon reflect conditions expected at the grade. Participants should therefore expect to be in a river environment during peak runoff for sometimes extended periods of time. A reliable white water roll on Class III, especially for consequential white water is required for this trip. You are welcome to Contact Us, if you would like to discuss the trip in more detail. * Airport Shuttle is to and from Bastia Airport or/and Ferry Port. All arrivals to any of Corsica’s other airports, will need to make their way to Bastia for pick up prior to 18:00 on the day of arrival or to Ernella Camping by late evening. Note budget airline flights into Pisa, Italy, with a short train ride (30mins) to ferry port of Livorno, Italy, and a 4 hour sail to Bastia, Corsica with Corsica Ferries our an increasingly popular option to the more expensive flights into Bastia. You’ll be staying at shared dormitory with Breakfast when at Ernella Camping. Although bed linen is provided a sleeping bag for cold spring nights is recommended. Other nights we will use local Gites. We’ll provide a continental breakfast. We’ll head to great local restaurants, plus provide the cooking equipment if as a group we wish to cook, as we road trip throughout Corsica. ** Gene17 has a small yet excellent selection of kayaks for a range of different sized paddlers, & these are available on a first come, first served basis ONLY. Our hire rate is 25€ a day or 125€ for the 6 days, this rate also includes paddle. We can not guarantee the use of Gene17Kayaking's kayak, will depend of notification before booking and local availability at the time of booking.